Microbiology Picture Quiz: Number 9: Answers | MICROBIOLOGY MATTERS ! This patient presents with unilateral parotid swelling. 1) What disease connects the presentation with the picture? Mumps. 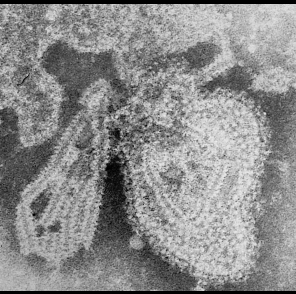 This is an electron micrograph of mumps virus, a picture that would not be seen in diagnostic laboratories these days as electron microscopes are alost all now confined to research facilities. In mumps, parotid swelling is bilateral in about 75% of cases, unilateral in the remaining 25%. Other causes of parotid swelling should be considered, the main ones being bacterial infection, salivary gland stones, autoimmune causes and tumours. 2) How can the diagnosis be confirmed in the laboratory? In areas of high endemicity or in an outbreak situation, the clinical findings may be sufficient. Where available PCR for mumps virus in the first week of symptoms is probably the optimal test, with a sensitivity of 75% in the first seven days of illness dropping thereafter. Sensitivity of mumps PCR for throat and urine samples are 50% and 25% respectively so are generally not recommended. Mumps IgM serology, or a fourfold rise in Mumps IgG antibody titres are other options. Mumps serology suffers from all the usual caveats of any serological test. Of note is that Mumps IgM can be falsely negative in patients who have had previous mumps vaccine. Mumps IgM can be falsely positive in patients with acute EBV infection. 3) Is viral culture useful for the diagnosis of this condition? Mumps virus can be cultured, but time to result, amongst other drawbacks of viral culture, means that in routine diagnostic laboratories, it is used very little compared to PCR and serological methods. For a bit more detail on the diagnosis of mumps see this readable article.